by Rebecca Probert (Author), Richard Woodhead (Contributor), Prof Charles Esdaile (Contributor), Naomi Pullin (Contributor), Prof Giorgio Riello(Contributor), Elodie Duché (Contributor), Dr Thomas Cardoza (Contributor). Catherine Exley was born in Leeds in 1779. Aged thirty, she boarded a ship and sailed for Portugal. 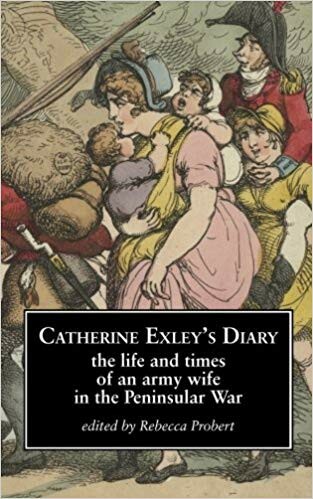 Her memoir of the years she spent following the 34th Regiment is unique, the only first-hand account of the Peninsular War by the wife of a common British soldier. Published shortly after her death as a booklet which has since been lost, Catherine’s diary survived in a local newspaper of 1923 to be rediscovered by her great-great-great-grandson. It is difficult today to comprehend the hardships Catherine endured: of her twelve children, three died as infants while with her on the march; her clothes, ‘covered with filth and vermin’, often went unchanged for weeks at a time, and she herself more than once almost died from illness and starvation; shocked at the mutilation inflicted by muskets and cannons, she still had the composure to manhandle blackened corpses upon a battlefield in search of her missing husband when hardened soldiers could no longer stomach the task. Her diary is reproduced here along with chapters which bear upon Catherine’s experiences in Spain and Portugal, and which put her life and writings in their social context.